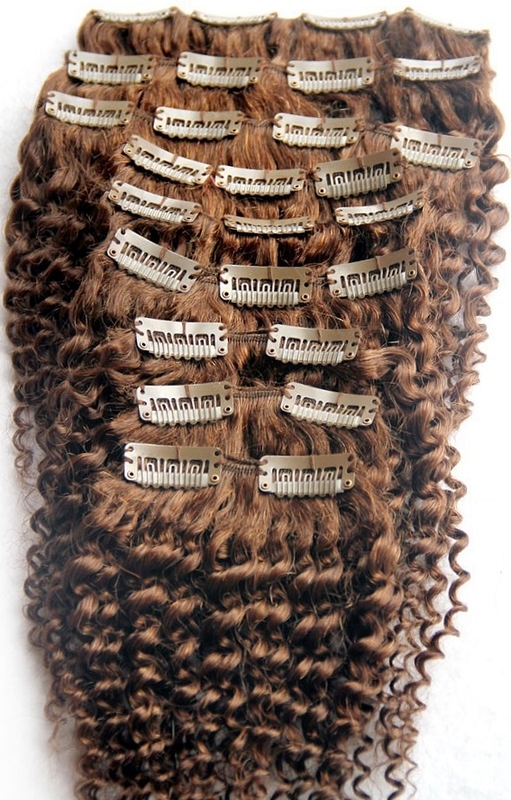 Afro curl clip on hair extensions are a great way to wear naturally (very) curly hair texture without using heat. Whether you’re transitioning from chemical straighteners, or just looking for another way to rock your natural Afro tresses, Afro curl clip in hair extensions provide a safe and easy to use option. Most hair extension wearers aim to blend their natural hair with their hair extensions and the Afro curl texture blends well with type 4 hair (Andre Walker definition). If your natural curl size is between 2mm and around 5mm then your hair will blend quite well with Afro curly hair extensions. Type 4 hair can sometimes lack curl definition but this is easily resolved with curl activators (which don’t alter the structure of the hair on a permanent or long term basis like relaxers or perms). Not all Afro curls are equal; the size of the curl can vary by a few millimetres but this isn't necessarily an issue as it’s quite normal for those with Afro textured hair to have different types and sizes of curls on different parts of their heads. Always check images and descriptions before you buy, as not all retailers allow hair extensions to be returned. Afro curl clip hair extensions follow the same path as all the other textures and come in single wefts as narrow as 1 inch wide or as wide as 9 inches. The narrower ones tend to be worn at the sides of the head and the wider ones are usually worn at the back of the head and up towards the crown. Multi width sets usually have a minimum of seven wefts of varying widths and can have as many as 12 wefts per set (there are also sets with fewer than seven wefts as well as sets with more than 12 wefts). Single wefts (and multi width sets) also come in different weights (thicknesses), so instead of buying a single 7” piece that weighs 80g you can buy a 7” piece that weighs about 25g and you can check out images of this here. 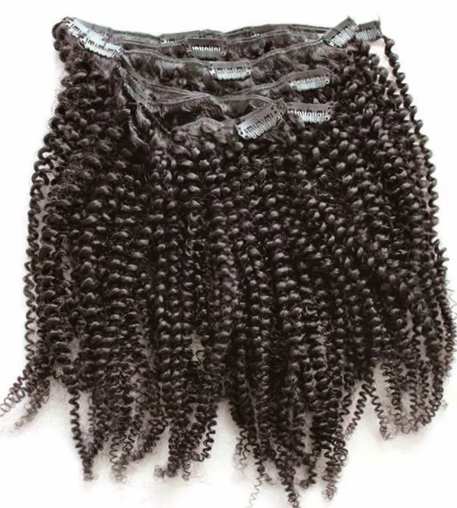 Afro curly clip on hair aficionados (or rookies who’ve read any of our other articles on clip in hair extension textures) will know that lengths available are usually 8 to 24 inches and that the length quoted is the length of the hair when it's straight. 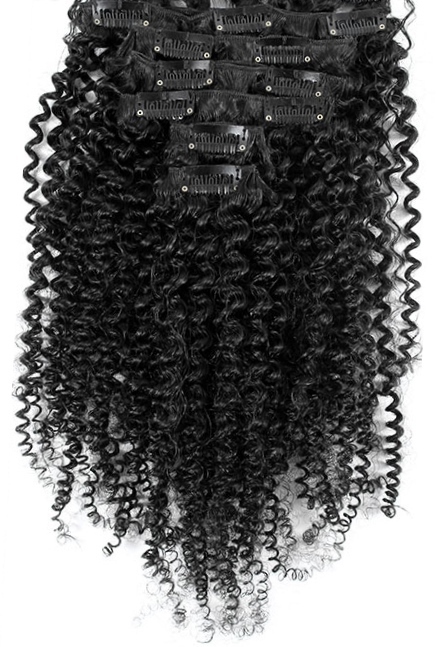 Afro curly clip in hair extension aficionados will also know that longer lengths are available but you’ll have to ask Lion-O to use the Sword of Omens to give you sight beyond sight as longer Afro curl lengths can only be found with a great deal of searching. The most widely available colours are browns and blacks. The limited colour range is compensated by the fact that the majority of Afro curly human hair extensions can be dyed (although this often requires lifting the colour first to achieve dark blondes and burgundy). We have guides about how to wash Afro and curly wigs (and prevent tangling), how to moisturize them (without creating frizz), how to select the best oils for keeping the hair soft, how to care for Afro hair weave and a Caring For Clip In Hair Extensions Guide. 1. Always detangle hair (from the ends, working upwards) before washing – use fingers first and then a wide tooth comb – if the hair is quite tangled, dampening it with a shampoo and water mix. 2. As the Afro curl texture was achieved through perming the hair, use a shampoo for chemically treated hair and use a leave-in conditioner or deep condition. 3. Regularly use water-based moisturizer, free from mineral oils (that can be sprayed) and use hair oils on damp hair. 4. Use a wide tooth comb to style the hair and avoid brushing the hair (unless you want undefined curls). 5. Keep the use of heat straighteners to a minimum as frequent use can damage human hair extensions. Afro curl clip in hair extensions over and out! If you have a hankering for more info, then check the Hair Extensions Q&A section or join our blog.